In our ‘Instagram-age’, we tend to think image-focused media as something contemporary. However, pictorial images have always played an important role in media, and the earliest printed books in Dutch are no exception. In the ‘new media’ of the late Middle Ages, images, in the form of woodcuts, were an important selling point. They did not merely embellish the book: woodcuts helped readers to find a certain section of a text (structuring tools), they conveyed (additional) information, and they functioned as meditative and emotion-arousing tools. At times, the images even seem to prevail in the use of these books since the narrative or information they convey can be accessed by anyone, regardless of their level of literacy. With a total of more than 900 woodblocks, Gerard Leeu, together with his brother Claes, was by far the largest supplier of woodcuts in the fifteenth-century Low Countries. He would have not suspected, however, that times would come in which the text he and his employees had painstakingly set and printed would be thrown away, while the work of the woodcutters that worked for him would be carefully preserved. Some of Leeu’s most profusely illustrated books are the editions of the so-called Boeck van den leven Jhesu Christi (Book on the Life of Christ), which contains a dialogue between Man (the reader) and Scripture (a personification of the Bible (fig. 1)) partially based on the fourteenth-century Vita Christi by the Carthusian Ludolf of Saxony. 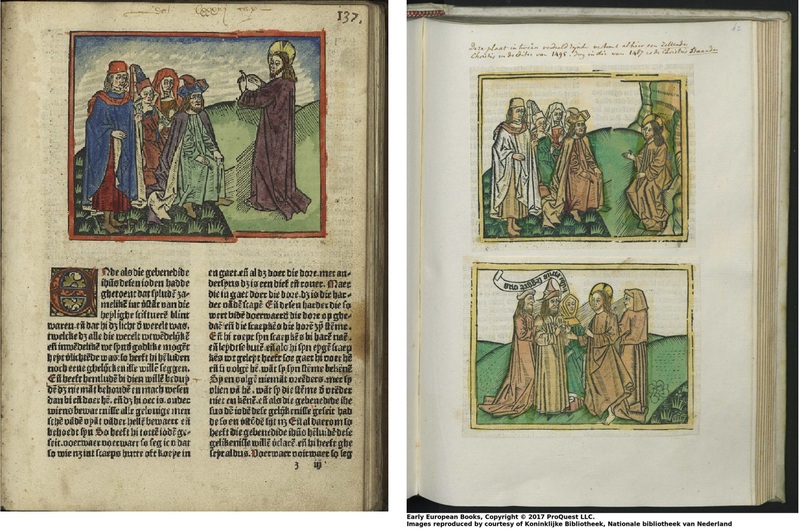 Gerard used a large variety of woodblocks for these editions – some new, others reused – and his brother Claes added even more images and decorative borders to the second edition that appeared under his name in 1488 in Antwerp. Fig. 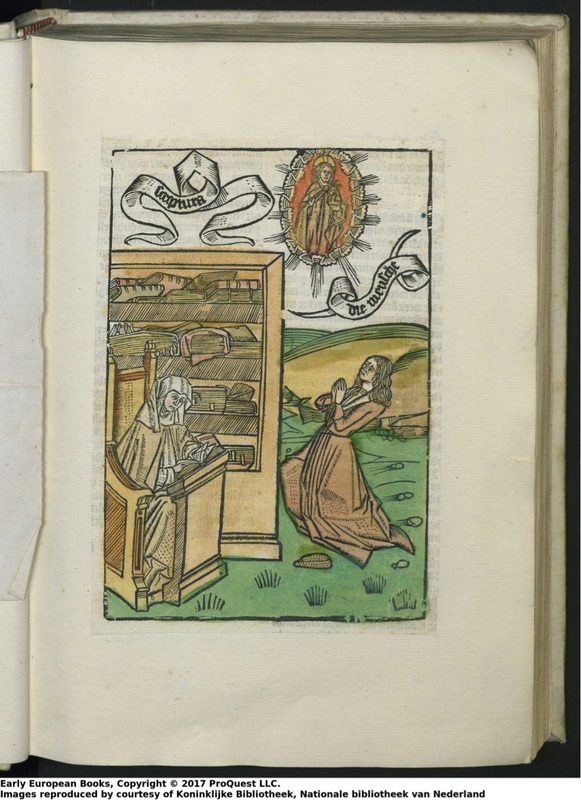 1 – Scripture and Man, hand-colored woodcut. Dat boeck vanden leven ons liefs heren ihesu christi, Zwolle: Peter van Os, 1495. Book of plates. The Hague, Royal Library, shelfmark 171 D 29, folio 2r. Photo courtesy of Early European Books online / ProQuest LCC, http://eeb.chadwyck.com. This book being already imperfect when I bought it, I threw aside all the leaves that had text only, and, retaining every leaf that had a cut, then send it to be bound. It will thus be found that every leaf has at least one cut. One was now saved from leafing through all of those tedious pages on which Scripture and Man try to make sense of the History of Salvation, and could happily ‘swipe’ from image to image. Even though in 1884 the woodcut specialist Martin Conway remarked that ‘as far as their style and design goes, they are amongst the worst productions of a bad period’ (The Woodcutters of the Netherlands in the Fifteenth Century, 57-8), pages with at least one ‘bad’ image still had more appeal to this nineteenth-century owner than the pages with text only. While in this case the language might have been a factor in the decision to throw ‘the text aside’ (the image comes to mind of a nineteenth-century English gentleman sitting next to a fire place and happily feeding the pages with Middle Dutch text to the flames), the lawyer and incunabula collector Jacob Visser (1724-1804) did not have such an excuse. Visser applied a more laborious and commonly used method to his copy of the 1495 edition published in Zwolle by Peter van Os, in which Leeu’s woodcuts were reused. He cut out every single image, carefully getting rid of all the text. The woodcuts were pasted onto blank leaves, creating a book of plates. 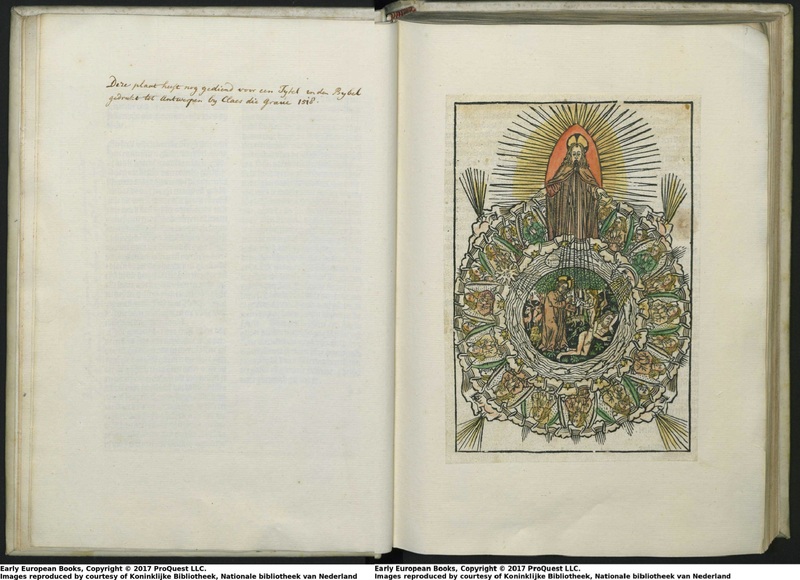 Most plates are accompanied by a (more or less extensive) annotation that resulted from careful comparison with copies of various editions of the Boeck van den leven Jhesu Christi and other fifteenth- and sixteenth-century books in Visser’s extensive incunabula collection. With regard to a composite woodcut of a group listening to Jesus, Visser notes: ‘This plate is divided into two and in the edition of 1495 here shows Christ seated, while in the one of 1487 Christ is standing up’ [Deze plaat in tweën verdeeld zijnde vertoont alhier een zittende Christus in de editie van 1495, dog in die van 1487 is de Christus staande] (fig. 2). Fig. 2 – A group listening to Jesus, hand-colored woodcut. Tboeck vanden leven Jhesu Christi, Antwerp: Gerard Leeu, 1487. Liège, University Library, shelfmark XV.C164, folio z3r. Photo courtesy of DONum, http://donum.ulg.ac.be. ]; A group listening to Jesus, hand-colored woodcut with annotation. Dat boeck vanden leven ons liefs heren ihesu christi, Zwolle: Peter van Os, 1495. Book of plates. The Hague, Royal Library, shelfmark 171 D 29, folio 42r. Photo courtesy of Early European Books online / ProQuest LCC, http://eeb.chadwyck.com. Visser also gives some clues for the re-use of Leeu’s woodblocks in early sixteenth-century books. He notes that the woodcut of Scripture and Man was still in use in 1515 and that the woodcut that depicts Creation ‘has still served for a title page of a Bible printed in Antwerp by Claes de Grave in 1518’ [heeft nog gediend voor een Tytel van den Bybel gedrukt tot Antwerpen by Claes die Grave 1518] (fig. 3). Other images, such as that of the parable of the laborers in the vineyard, Visser found in his copy of Den grooten Cathoon vol vruchtbarigher leeringen historien ende exempelen, printed by Claes de Grave in 1535. Fig. 3 – Creation, hand-colored woodcut with annotation. Dat boeck vanden leven ons liefs heren ihesu christi, Zwolle: Peter van Os, 1495. Book of plates. The Hague, Royal Library, shelfmark 171 D 29, folio’s 2v-4r. Photo courtesy of Early European Books online / ProQuest LCC, http://eeb.chadwyck.com. Even though in both cases valuable pages and material evidence were unquestionably lost, what we do gain in these copies are equally valuable witnesses of the treatment of late medieval printed books by their eighteenth and nineteenth-century collectors. The plate book put together by Jacob Visser gives a wonderful insight into the interest of a book collector in the changing use and re-use of woodcuts, and as such into the beginnings of the field of bibliography and book history. A fascination for images is of all times.